Le Petit Maine, is a small, rural hamlet situated in “sunny southwest France” on the Charente/Dordogne border close to the very pretty medieval town of Aubeterre. Here you will find our traditional Charentaise farmhouse and 2 gites, Le Petit Paris Ref 8024353 and La Petite Alsace Ref 6928256, set amongst 5 acres of French countryside. Whilst holidaying here, you can relax in the privacy of your gite's own patio facilities or the swimming pool, play areas and sheltered dining area . Wherever you choose to relax at Le Petit Maine, you will enjoy magnificent uninterrupted southerly views. The countryside, culture and cuisine of this area invites those seeking rest and relaxation, at the same time there are activities available that would appeal to the most energetic of adults and children. Spend time enjoying local markets, winetasting, cycling, canoeing and swimming at the riverbeach of Aubeterre and Brossac lake or visit nearby Angouleme, Bordeaux and Cognac. Le Petit Maine's prime location also allows visitors to reach the seaside areas of Royan and caves of the Dordogne. The bathrooms in both gites are downstairs and have showers. Dining table and chairs to seat 5 in Le Petit Paris gite. Dining table and chairs to seat 4 in La Petite Alsace. Both gites have private patios with dining table and chairs. Private pool between 2 gites. Large,immaculately maintained 10m x 5m pool. Easy access by roman walk in steps, same depth of 1m throughout. Covered each evening to maintain water temp over 26*C.
Notes on accommodation: Utility and games library room with washing machine, ironing facilities, books, maps, indoor and outdoor games, CDs and videos to use in own gite. Cots, safety gates & highchairs are available by request at no extra charge. Cooling fans are provided. Information packs with regional guides provided in gites. Well behaved pets are welcome by request. Ideal outdoor environment and space for families but equally tranquil and excellently located for couples holidaying out of the school holiday period. Outside: Large private patio with garden furniture, BBQ, private parking facilities and views to the open countryside. Beyond the patio is the large garden area, pool, play areas and sheltered area for evening meals. Evening meals are offered in the 'pop up' Bistro dining area. More information is available on enquiry. Cleaning / Towels / Linen / Maid service: Linen and bathroom towels are provided weekly. Please supply own pool/ beach towels. A 10 minute drive will take you to Aubeterre where you will find a river with a beach area for safe bathing, canoe hire and restaurants. Brossac is also close by with a large lake with beach area, play area and restaraunts. A 1.5 hours drive through the beautiful countryside of the Cognac vineyards takes you to our nearest seaside town of Royan and its neighbouring resort of La Rochelle. Royan has a large sandy beach, bustling yachting harbour and lots of restaurants and entertainments. By air: Bergerac airport, 60km. By ferry/road: Nearest port, St Malo 4.5-5 hours drive. Northern French ports 7-8 hours drive. By Rail: Eurostar from London to Paris. The TGV train service is 2.5 hours Paris to Angouleme (met by local train to Montmoreau-St-Cybard). Local train 1.5 hours Bordeaux to Montmoreau-St-Cybard. Montmoreau, 5 mins drive, supermarket, market, restaurants. Chalais, 10km, larger town with busy market and renowned Chateau with dungeon restaurant. Aubeterre, 15km, pretty town square for history, eating and shopping. River Dronne for bathing and canoeing. Angouleme, 40km, city with music and restaurants. Cognac, Bordeaux and Bergerac all close by and famous for wine routes, architecture and French ambience. Beautiful Brantome and cave/rivers of Dordogne within reach. Around the area, local villages and towns host markets and fetes throughout summer where a tradition to be enjoyed are the 'evening producteurs markets'. Culinary specialities of the region include Foie gras which is made by a nearby nationally-renowned producteur along with many other types of pate and terrine to try, including wild boar (Sanglier). On the road to Aubeterre you can also find a Walnut Oil producteur, who welcomes sampling. A Sunday tradition of the sale oysters from high street stalls can be enjoyed for a remarkably reasonable price. All seasonal fruits and veg are plentiful at the local markets. Our local, liquid, speciality is Pineau de Charente – a blend of grape juice and young, fierce Cognac, drunk as an aperitif, ice-cold, and then a bit later with food. Vineyards offering tastings are well signposted around the region. There are also 2 local small independent breweries, offering interesting flavoured beers. Whether you choose to enjoy cuisine and fine wines or participate in the French custom of cycling, canoeing or bathing by the rivers and lakes, we hope you have the time to explore the places of interest which are easily accessed from Le Petit Maine. For something different, visit Angouleme's annual vintage car rally, Cognac's world famous annual jazz & blues festival, Chalais's international showjumping competition, Aubeterre's monolithic church or 'Le tour de France' if in the area. Please note the price quoted is for ONE gite only. La Petite Alsace Ref 6928256 our 4 person Gite. If you would like to book both gites, please make enquiries to both adverts. 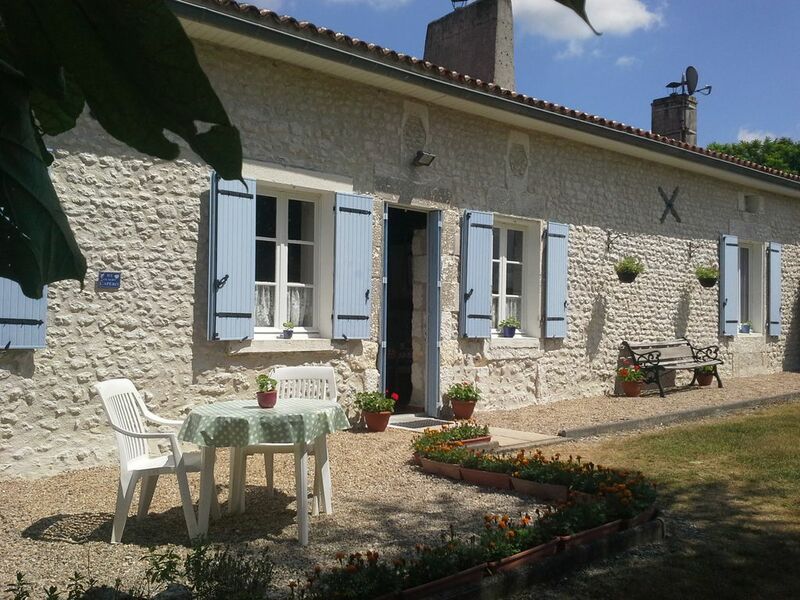 Le Petit Paris our 5 person gite is Ref 8024353 Booking Notes: Bookings can be made by phone or via e-mail. A £100 deposit per week of your booking is required to confirm. Full payment must be made 12 weeks before arrival date or on booking if made 'last minute'. The deposit to secure your booking & covers excess heating charges, damage or breakages & will be returned if the property is found to be in an acceptable condition on departure. Changeover Day: Changeover day is Saturday. Arrival after 3pm and departure 10am to allow cleaning of the gite. This can be flexible out of peak season, please contact us to discuss your requirements. Notes on prices: Please refer to our private Le Petit Maine Gites website for more accurate pricing.